2/7 WKND: RITZ STATE RECORD MILE! Sargent US#2 3000! Geist US#2 SP! Brissett first sub 7 60 dash! Brophy 8:45 3K. Follow here all weekend! Hayden Fox of Hempfield (7) set a new personal best in the pole vault, clearing a PA#2 15-1 to win the boys pole vault. Fox has equaled or set a personal best clearance in each of his 3 appearances this season. Jordan Geist of Knoch threw 61-5 to cruise to another shot put victory. For the girls, Ravenne O'Lear of Hempfield (7) cleared 10-9 to win the pole vault. Lexi Stevenson of Bethel Park threw 37 feet even to win the shot put. Courtney McCartney of Selinsgrove evened up her rivalry with Emily Stauffer of Cocalico in the shot put with a near 2.5 foot victory. McCartney threw 46-5.50, while Stauffer threw 44-1. The boys shot put winner was Hezi Crosby of West Chester Rustin with a throw of 45-9. Snow delayed this meet back on January 24, and the makeup date worked out well for a trio of Division 2 800 meter runners. Kevin James of Cardinal O'Hara led three runners under 2 minutes at Glen Mills, running 1:58.93 to edge out Julian DeGroot-Lutzner of Masterman (1:59.12) and Colin Wills of Malvern Prep (1:59.46). Milton Jones of Glen Mills threw 53-5.75 to win the shot put. In division 1, Donovan St Louis of Upper Darby ran 51.78 to win the 400 meter dash. Nicholas Marino of Hatboro Horsham cleared 13-9 to win the pole vault. Sarah Walker of Germantown Friends kept her momentum going with another victory, taking the mile in 5:01.6. Ally Rome of Dallas was also a winner on the night, taking home the 3200 meter run in 11:18.2. Cheltenham girls sprinters were business as usual. Ciara Leonard ran 7.6 to win the 55 meter hurdles. Chanel Brissett ran 24.4 in the 200 meter dash, and Madison Langley-Walker jumped a season best 17-9.25. For the boys, Charles Headen of Lasalle won the 55 meter dash in 6.1 and he ran an indoor best 22.2 in the 200 meter dash. Khai Samuels of Pleasant Valley ran a season best 1:58.1 in the 800 meter run. Conestoga ran a PA#2 10:29.5 in the distance medley relay. Olivia Sargent of Pennsbury was the show stopper at the final DVGTCA regular season meet of the year. The junior won the 3000 meter run in a US#2 9:59.22! Her performance makes her the 3rd PA girl to break 10 minutes. 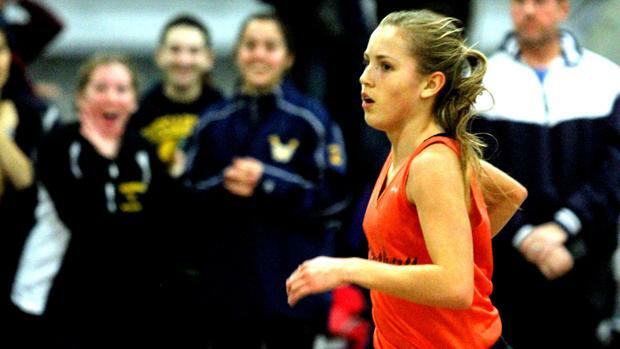 All three sub 10 performances at 3000 meters in the country are all from PA kids! The girls 4x800 meter relay had six sub 9:41 performances, which would put all the teams in the state's top ten. Great Valley emerged victorious against the pack with a season best 9:34.46. 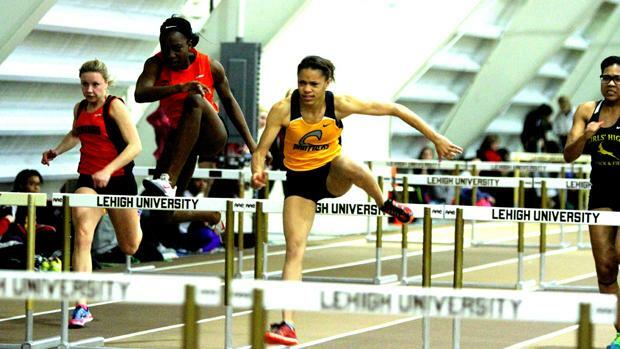 Ciara Leonard of Cheltenham kept her 100 percent record in the hurdles in tact, winning the 60 hurdles this week in 8.73. 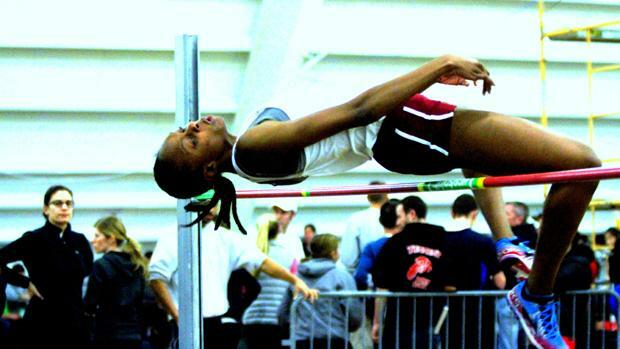 Victoria Matthews of Abington cleared 5-5 to win the high jump. Sam Ritz of Germantown Academy finished 5th in the junior boys mile with a personal best and PA STATE RECORD 4:10.50. West Chester Henderson boys ran 10:48.16 to finish 9th in the distance medley relay. Marissa Sheva of Pennridge finished 12th in the junior girls mile in 5:12.39. Marissa Sheva of Pennridge will run the junior girls mile race for the 2nd year in a row, and it will be her first mile race since her 4:50.73 performance on December 20. The Penn State commit will look to rebound after her tough defeat in the 3000 at Penn State two weeks ago. She is still US#2 and has held that position for 8 weeks behind US#1 and one of her opponents, Ryen Frazier of North Carolina. A full girls race preview is available HERE! Sam Ritz of Germantown Academy will run the boys junior mile. The senior has run in every big race available to him this season, so he will have plenty of experience going into this race. His seasonal best is 4:14.59 from the January 10 Hispanic Games, which is currently US#10 this season. A full boys race preview is available HERE! West Chester Henderson boys will run the distance medley relay in an attempt to get themselves into the state meet picture. The Ches-Mont league powerhouse sit at PA#16 and will need to make up ground to guarantee state qualification. Division 1 was on fire today with 30 performances hitting the PTFCA state qualifying guidelines. Leading the charge were the two PA Foot Locker Finalists from the cross country season. Jake Brophy of Central Bucks East (PA#4 8:45.21) and Casey Comber of Hatboro Horsham (PA#5 8:48.75) finished 1-2 in the 3000 meter run to put them in state title contention. Christian Brissett of Cheltenham became PA's first sub 7 second 60 meter dasher, running 6.96 to earn the win. Teammate John Lewis won the 400 meter dash in 49.32, and Cordell Richardson made it three Cheltenham wins with a 60 hurdles win in 8.36. In division 2, Tyler Whitmore of Upper Moreland ran a meet record 22.82 to win the 200 meter dash. Billy McDevitt of Malvern Prep ran 1:57.12 to win the 800 meter run. Sam Pope of Episcopal Academy took the state lead in the triple jump with a winning mark of 46-10.50. Jordan Geist of Knoch is back to the US#2 position in the shot put with his winning mark of 65-10.75. He is now nearly three feet off the state record of 68-11.50 by Ryan Whiting with two plus years of competition to go. Brianna Schwartz of Shaler Area made an emphatic season debut, entering the three longest races of the meet and winning all three with US top ten performances. Schwartz started off with a 1600 meter win in a US#3 4:55.86 to hold off US#4 Madeleine Davison of North Allegheny (4:56.81). Schwartz then got the best of Davison again in the 800 with a US#6 2:14.30 to US#11 Davison (2:15.50). Lastly, she won the 3200 meter run leading two others under 11 minutes. Her US#7 time of 10:47.90 held off Kelsey Potts of Mount Lebanon (10:57.90) and Marianne Abdalah of Vincentian Academy (10:58.96). Abby Jones of Franklin Area cleared 5-7 to win the girls high jump and come within an inch of the two state leaders Cyre Virgo of Fleetwood and Erika Voyzey of Tyrone Area.